Wednesday June 12th 1895 I did some work in the garden in the morning and got the dinner. I was over home in the afternoon. I brought home strawberries for supper. Will is plowing corn today though his back still hurts him. Thursday June 13th 1895 Will helped me do the washing this morning. I got the dinner and did the cleaning up in the afternoon. I picked a few gooseberries late in the afternoon. Miss Linder picked them over for me. Will still plowing. Friday June 14th 1895 Will was home this morning and I went to town for him. I took down the butter to the customers. I got back at ten oclock and ironed some. I finished after dinner and worked in the garden some before supper. Saturday June 15th 1895 I was busy all forenoon with doing baking and sweeping we went to town after dinner. I spent the time over home. Father and Mother had gone to the valley. Will and I picked gooseberries after supper. 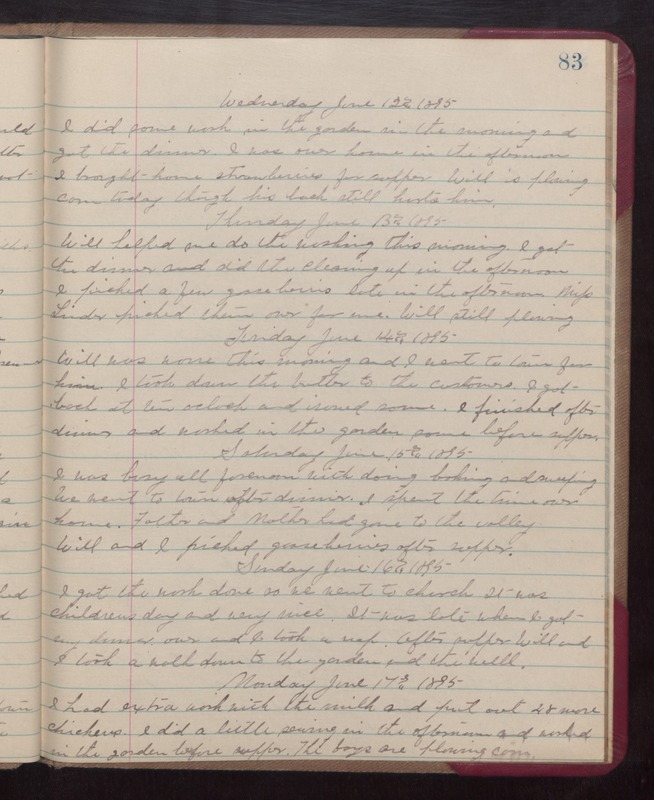 Sunday June 16th 1895 I got the work done so we went to church. It was childrens day and very nice. It was late when I got my dinner over and I took a nap. After supper Will and I took a walk down to the garden and the well. Monday June 17th 1895 I had extra work with the milk and put out 48 more chickens. I did a little sewing in the afternoon and worked in the garden before supper. The boys are plowing corn.